Folks, this box is amazing. £25 gets you a total of 15 miniatures, including the new Reivers for the Primaris Marines, as well as three new-pose Intercessors, three new-pose Death Guard, and six alternate-looking Poxwalkers. 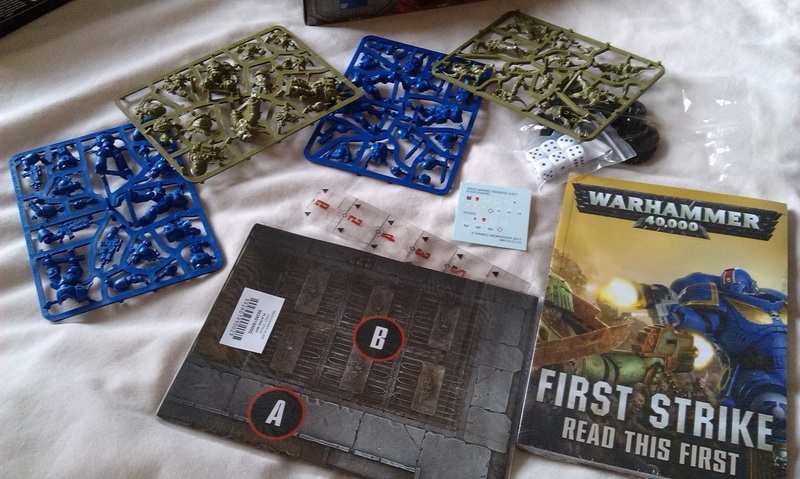 Additionally, you get pretty much everything you need to start playing games right there and then – dice, measuring thing, a poster-map, and the inner tray of the box doubles as a terrain piece. The only think you’re missing when you buy this is another person to play against, really! There are a couple of books in here, one of which is a sort of background book that also has handy stuff about assembling and painting miniatures, and the other is the original 8-page rules pamphlet thing included in the Dark Imperium box, conflated with some of the additional rules content like missions etc. You also get datasheet-cards for each of the four types of miniatures included, which I really enjoy and would probably buy versions of them for all of my other armies, should GW ever feel the need to put this sort of thing into circulation (hint, hint). Forget all of the naysayers who decry push-fit, “easy to build” miniatures. These things are as detailed as any other Citadel miniature, and just because you can’t get your space marine’s arm at precisely the right angle is not reason enough to dismiss these things, in my view! Sure, I’m looking forward to the proper multi-part plastic kits that will hopefully be on their way soon, but for now, I’m fine with this stuff! 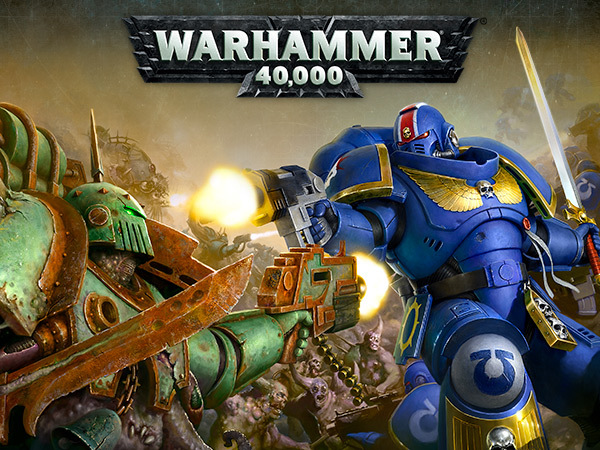 With the release of the Codex: Space Marines on the horizon, I’m looking forward to seeing what else will be coming out to support the line of new Primaris stuff. I caught the chat with Phil Kelly on Thursday talking about the new stuff, where he showed off an image of some new and some old Chapters in Primaris armour, and have started to think about adding some to my Novamarines as well as doing the Dark Imperium box as Genesis Chapter. Might do a couple of squads as Novamarines when the proper kits drop, we’ll see. In addition to the Repulsor Tank and the Redemptor Dreadnought though, there are rumours flitting about that we’ll be seeing Apothecaries, Chaplains and “something heavy”, a cross between Centurions and Terminators. That could be great, though I’m also a bit concerned it could look silly. I guess we’ll have to wait and see! But I am looking forward to seeing how they grow this new line, no matter how much the internet wants it to go away. 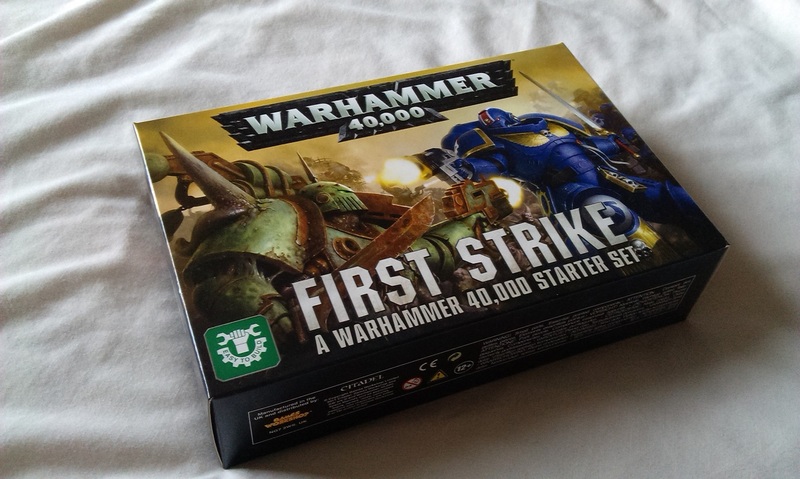 First Strike is an incredibly good value way to get into 40k, and I would go as far as to say everybody who bought the Dark Imperium box should also get this, just for the alternative pose miniatures to pepper through their existing squads. Definitely worth picking up for £25!